Noel Lawler Consulting Engineers with Green Energy Solutions (GES) together through our International Umbrella Organisation Pivotal International are delighted to have been recently involved in the development of the Unit 3 Masthead Tesla Project. NLCE committed both Mechanical and Electrical Services to this development and are very impressed with the end result. Mechanical services for this project included comfort cooling systems, heating systems, ventilation, hot and cold water, distribution mains for services and well as drainage services. Electrical services entailed the introduction of power, lighting and emergency lighting. A co-ordinated ceiling plan was also to be included in the designs. The project took a total of nine weeks for initial technical design to handover and close out. There were a number of different areas in this building, all which required different considerations. The showrooms, required ceiling hung lighting. This created the best overall look to the showroom, giving the cars a gleaming finish. The offices, many of which did not have windows, required better use of artificial lighting but also needed to provide the space with a glare-free working environment. Automatic sensor lights were included in the offices for both convenience and energy conservation. Many of the individual offices were small in size and had either a glass door or wall looking out on to the showroom. These offices needed sufficient access to air conditioning/heating. Ventilation of these smaller offices was also a priority. 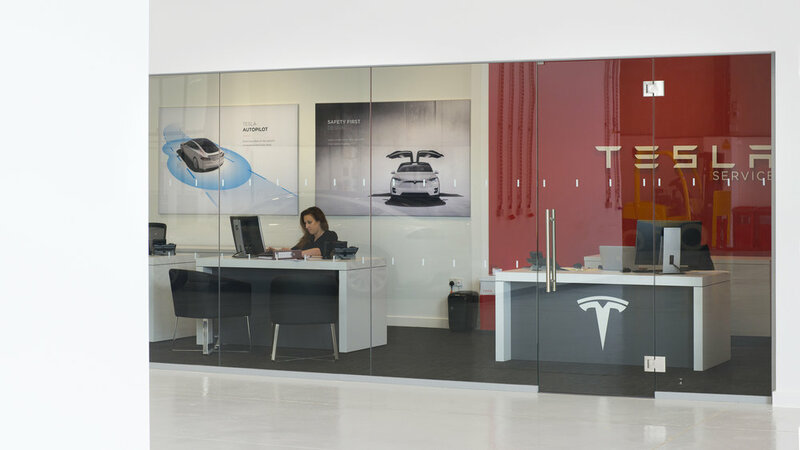 Due to Tesla’s white and red branding, all interior walls were painted white, creating a naturally bright environment. Any visible electric boxes that were installed on the walls of the internal building were white to in-keep with the branding of the site.